Bumpass Hell is the largest area of geothermal features in Lassen Volcanic National Park, and is part of the region once covered by the ancient volcano Mount Tehama. The basin received its curious name from a disgruntled explorer (Kendall Bumpass), who lost a leg after falling into a boiling pool in 1864, and may be reached today either from a well-marked 1.5 mile trail that starts from a parking area opposite Lake Helen, just 2 miles south of Lassen Peak near road marker 17, or by a less-used, 2.5 mile path from the Kings Creek picnic area. Bumpass Hell is definitely one of the highlights of the park, and there is rather more to see than at the other easily-reached thermal area (Sulphur Works), along the highway. 17 views of Bumpass Hell. Panorama of Bumpass Hell basin. Features of Bumpass Hell (mp4; 0:45 min; 9 mb). The 1.5 mile path from the Lake Helen trailhead is quite easy, crossing generally rocky land partially covered by trees, and without experiencing much change in elevation. It curves round a ridge extending west from Bumpass Mountain, and ends with a 200 foot descent into the basin. The route is closed by snow for most of the year, and even in summer slippery patches may remain for some time after the opening date, usually at the start of July. The active area can be seen (and smelt!) from some distance away - a wide valley filled with steaming pools and unusual multi-hued soils, stained orange, brown, yellow and green by sulphur and other chemicals. Together with the occasional white snow patches, the (usually) deep blue sky and the aquamarine waters, the spectacle is extremely beautiful and colorful. The longer (2.5 miles) but quieter and more scenic alternative route to Bumpass Hell starts from the Kings Creek picnic area, reached by a short side road off Hwy 89. The first part of the trail is the same as for Cold Boiling Lake; once here, the path forks, and the right branch curves round the edge of the lake then begins a long, continuous ascent up the side of a ridge on the southeast flank of Bumpass Mountain, through dense, shady patches of woodland separated by wider open areas where the ground is covered with grass and wildflowers. A few tiny streams cross the path, which is soon 500 feet above the valley below and has good views of both Cold Boiling Lake and nearby Crumbaugh Lake. Eventually it reaches the end of the ridge and bends north, still climbing, up to the top of a hill overlooking Bumpass Hell, before descending a little and joining the main approach trail at the west edge of the basin. The total elevation gain is 850 feet. 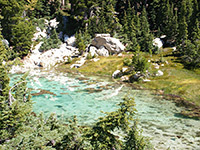 Both approaches have good overall views of Bumpass Hell from elevated vantage points, before the trails descend, and connect with several raised wooden walkways that traverse the unstable ground and lead towards particular points of interest. 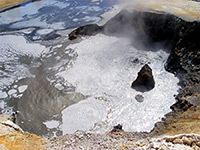 Most noticeable are several large hot pools, gray-blue in color and up to 50 feet across, often with simmering, bubbling water in places. There are also many mudpots of varying viscosity; some are quite thin and effervesce vigorously whereas the less active ones have the consistency of treacle and plop every few seconds. Other features include small water fountains, steaming soil, noisy fumaroles (sulphurous steam vents) and run-off channels with warmish acidic water, edged by colorful mineral deposits. Three of the pools have an official name: East Pyrite Pool is perhaps the most unusual, a large, sunken hot spring filled with seething acidic water topped by layers of molten grey/black iron pyrite. On the opposite side of the boardwalk, West Pyrite Pool is a calmer but prettier spring containing turquoise water, surrounded by mostly white rocks colored yellow and brown by iron and sulfur. Nearby Big Boiler is the largest fumarole in the park, and the hottest in the world, emitting steam at temperatures up to 322°F. 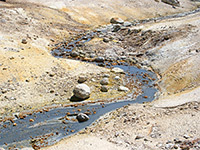 All the springs produce enough water to form a small stream (Bumpass Creek), which after exiting the basin flows steeply southwards through a narrow, inaccessible ravine lined with other thermal vents. Bumpass Hell contains around 75 active features but many are either small or not properly visible from the path, so it doesn't take long to tour the area. Bumpass Hell, and Lassen Volcanic National Park in general, has three of the four main types of geothermal feature (fumaroles, mudpots and hot springs); the only phenomena missing are geysers, since these require rather specific conditions of rock type, sub-soil temperature and water depth. They are however found in great abundance in the remarkable Yellowstone National Park in Wyoming, which also has much more of every other type of thermal activity, but Lassen has a greater sense of tranquility, is more compact and has the added attraction of volcanic features. It is probably of no immediate concern, but some of the hot pools at Lassen are becoming gradually hotter and so future eruptions seem possible.